It's more than just another makeover show. The new season of Queer Eye dropped just a few days ago, which meant that I spent most of my weekend binge-watching the Netflix series and crying my eyes out. If you haven’t seen this show, it’s time you crawled out from under your rock, because it’s serving up all sorts of greatness. Self-care is not selfish, and it’s kind of a necessity. When did we start learning that taking time for ourselves is not okay? In this busy thing called life, it’s easy to push self-care to the back burner, and we have this terrible habit of feeling guilty when we do take time to focus on us. But the reality is, we need to give ourselves the most attention. Self-care helps us be the best version of ourselves and that ultimately helps us be better for those around us. Learning to slow down and take a few minutes to focus on yourself can make all the difference. Jonathan Van Ness, our self-care queen, does a great job of reminding us that even taking a few minutes to prioritize ourselves and apply some moisturizer and sunscreen can make a world of difference. Food should be fun (and it doesn’t need to be complicated). Food has all sorts of incredible powers, but one of my favorites is that it can bring so much joy to our lives. Queer Eye and its resident foodie Antoni Porowski shows us that food is supposed to be fun, and it doesn’t need to be complicated. Too many of us get in food ruts, where making food becomes more of a burden and a chore rather than a treat. We need to remind ourselves that cooking a delicious (and nutritious) meal can actually be a fun experience, and cooking can help us connect with ourselves and those we eat with. There are plenty of simple meals that allow us to explore the art of cooking, and leave us feeling happy and full. Create a space that brings you peace. In the final episode of season three, Bobby Berk says that most people don’t think their house has an effect on their mental health, but it does. We spend so much time in our homes. As a result, I would think we would want them to be a small piece of paradise that allows us to relax. However, life happens, and our houses can become messy and cluttered, and we don’t invest as much energy into our houses as we should. That can wind up leaving us feeling overwhelmed and scattered. Bobby reminds us to put time and energy into our homes. If we do that, the result is a place where we can honestly feel at home. The outside world is already stressful enough, so if we take a few moments, even once a week, to clean up and reset our space, we can make a tremendous impact on our own well-being. Acknowledging your feelings doesn’t make you weak. Every episode of Queer Eye is full of a whole lot of feels, which is why we all keep the tissue boxes close by when we watch. One lesson that the Fab Five is always reiterating is that we have to acknowledge all the emotions we feel, even the crappy ones, to move on and live a happier life. Karamo Brown helps the show’s guests work through some pretty tough stuff, and most of them have spent a whole lot of time and energy ignoring their feelings. Karamo shows us how the simple act of stating what we are feeling has a profound impact on our overall quality of life, and it can reverberate into all areas in our life. It never makes the guests look weak when they break down and address all their feelings, instead it actually makes them look strong as hell, and it leaves us with inspiration to do so ourselves. Your body is amazing, learn to dress it correctly. Have you ever put on an outfit, looked into the mirror, and immediately hated your body and how the clothing made you look? I know I have, a lot. 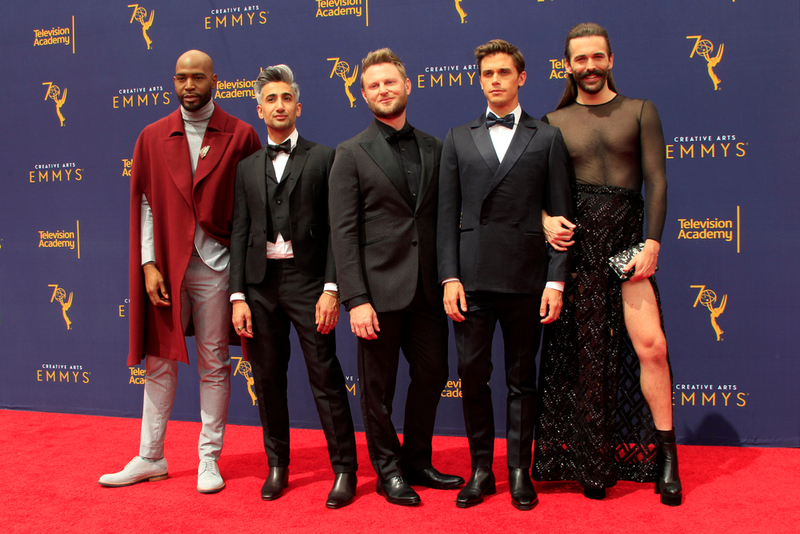 Tan France, Queer Eye’s fashion guru, does a great job reminding us that no matter what our body shape is, the right outfit can make us look amazing. His fashion makeovers are proof. By spending some time to learn which looks accentuate the parts we actually like about ourselves, we can learn to see something beautiful in the mirror. Dressing correctly for our body types can help us present ourselves more confidently and make us feel more comfortable in our own skin. We can learn a lot from watching the Fab Five work their magic on Queer Eye. They do a great job of reminding us that while life is always going to have its challenges and setbacks, there is so much room to love ourselves, find joy in every moment, and spend more time smiling. I love that there is a show to share these lessons (and so many more) with us! Whitney is the writer behind @acupofchaos, a space dedicated to talking about the real moments in life, even the not-so-pretty parts. You will find her drinking a cup of coffee or a glass of wine while sharing her mental health breakdowns and lessons-learned. Her work has been published on sites like The Mighty and is designed to remind others that they aren't alone as the figure life out.